The humming tone inside my head has risen to a concert. I´m sitting amidst the orchestra and await the cue for my coming in. Which instrument am I going to play? 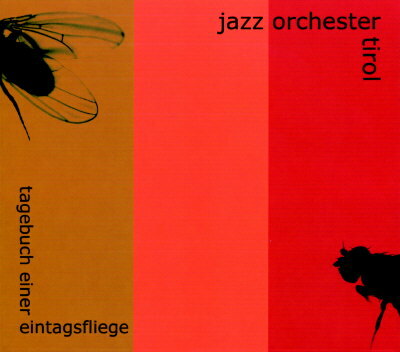 „Diary of a Day-fly“ , the 35 – minute – long work composed by Martin Ohrwalder for big band, narrator and electronics, represents the Jazz Orchester Tirol´s main-part of the 2007 – live-programme and its new CD´s title. Martin Ohrwalder's composition is based upon a Japanese text from the 9th century. As he did with his arrangement of Mussorgskij´s composition for piano „Pictures At an Exhibition” in 2004, he again creates much space for his fellow-musicians' improvisational freedom, which leads to new interpretations of the work at every performance. The result is an exciting blend of old and new. The Jazz Orchester Tirol, founded in 2001, brings together renowned Tyrolian jazz-musicians, who also work outside the country´s borders, thus enabling a new, unmistakable ensemble-sound in the modern Tyrolian culture- and musicscene. In 2003 the orchestra´s first CD „Jazz Orchester Tirol - Neue Lieder“ was recorded, including compositions exclusively written by bandmembers and Tyrolian composers. Apart from „Diary of a Day-fly“ , the new CD also includes “Innsbruck ich muss dich lassen”, arranged by Florian Bramböck, “Zillertal wo is mei Freid” by Christian Wegscheider, Christoph Pepe Auer´s “White Rain” and a Stephan Costa-penned arrangement of Doug Hammond´s composition “Closing Down”.